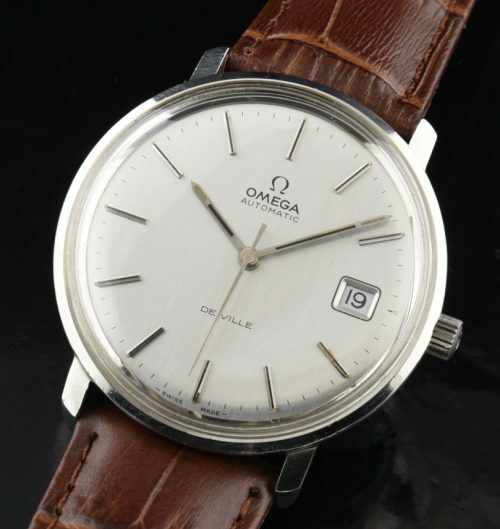 Home / Shop – Vintage Watches For Sale Used & Antique / Uncategorized / OMEGA De Ville Large and Uncommon 36mm. OMEGA De Ville Large and Uncommon 36mm. This is the FIRST time I’ve discovered one of these watches! This is a LARGE 36mm. 1970’s OMEGA De Ville. Normally, these are 34mm. This one even looks LARGER due to the narrow bezel and all-dial appearance. This watch looks quite sprawling on the wrist. Speaking of the dial…WOW-it is amazing, being pewter with needle markers and hands. This dial is so subtle, sleek and cool! The original crystal and crown are present. The automatic winding OMEGA movement was just cleaned by our watchmaker and is accurate. The steel case with raised de Ville logo is quite sleek on the case rear. The angled lugs are different than we normally find as wwell. We will not open the case to risk damage, as these are one piece cases. We guarantee (of course) that the OMEGA movement is all correct. Don’t hesitate on this one as you may not see another.